A dental extraction is the removal of a tooth. Our goal is to help you keep your teeth, but in some cases, our options are limited due to advanced dental conditions. If you need dental extractions, we will work closely with you to ensure your comfort and make sure you are aware of your tooth replacement options. If it is necessary to remove a tooth, this is the optimal time to plan for tooth replacement. If a tooth is removed and nothing is done with the extraction site, the jaw bone can degenerate and change shape during healing. This can cause a bony defect and adjacent teeth may begin to shift. This can create problems in your bite and affect your oral health. If you are considering filling the space with a dental implant, adequate bone is important and if you want a bride, it should be placed before teeth shift. If you have questions about extractions or tooth replacement, please call us today. Bone grafting following extraction is a common, simple procedure. After the socket is cleaned, bony fragments are packed into the site and may be covered with a dissolving covering. Wisdom teeth: Wisdom teeth are the third and final set of molars that emerge, usually during your late teens to early twenties. Some people have enough room for these teeth but many people need them removed. Wisdom teeth can be malpositioned or they can become impacted. When they are not able to fully come in or lack space, they can cause structural damage to the jaw and other teeth. They can also provide a place for food and bacteria to gather which can lead to pain and infection. Routine radiographs during your exam can help reveal if you should have your wisdom teeth removed. Contrary to popular belief, root canals should not be painful. Root canal therapy may be indicated for teeth that have advanced nerve inflammation or infection. This can be due to large or repeated dental procedures on a tooth, a cracked tooth, or dental trauma. Teeth needing root canals are often sensitive, have a history of dental restoration, or may be discolored. Root canals are used to repair and save your tooth instead of removing it. infected and an abscess may form. This can lead to further infection, swelling, and pain. After healing, a tooth with a root canal needs a crown to protect it. If you would like more information or to schedule and evaluation, please call us today. Several medications are available to help create more relaxed, comfortable dental visits. Some medications control pain, some help you relax, and others put you into a deep sleep during dental treatment. The type of procedure, your overall health, history of allergies, and your anxiety level are considered when determining which is best for you. 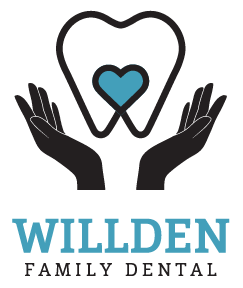 Ask Dr. Willden if nitrous oxide would be a good option for you. For your treatment, we have comfort-aids including neck pillows, blankets, essential oil therapy, bite blocks, and IsoVac®. Please ask us how we can make your visit more comfortable. If you have an emergency after regularly scheduled hours, call us at (970) 249-2533 Please leave a message and we will work with you to find a solution. appointments to ensure optimal timeliness and attention. We understand that emergencies happen and with advanced notice, we can usually address your needs same-day. Please call us if you have any questions or would like to schedule your appointment.